Mitravinda is the sixth of the Ashtabharya, the eight principal queen-consorts of Hindu god Krishna, an avatar of the god Vishnu and the king of Dwarka - in the Dwapara Yuga (epoch). In the Bhagavata Purana, Mitravinda is described as the daughter of King Jayasena of the kingdom of avanti. Mitravinda was known by the epithet "the virtuous" and called as Shaibya or Shaivya (meaning daughter/descendent of king Shibi/Shivi) in the Vishnu Purana. Ratnagarbha, a commentator on the Vishnu Purana, identifies Mitravinda with Kalindi, another chief queen of Krishna. In Harivamsa, she is referred to as Sudatta, the daughter (or patrilineal descendant) of Shibi. She was a very virtuous, noble and beautiful girl. The Bhagavata Purana describes that she had two brothers Vinda (Vindya) and Anuvinda (Anuvindhya), who ruled Avanti as co-regents at the time of her wedding. They were comrades of Duryodhana, the leader of the Kauravas. They were therefore opposed to the idea of Mitravinda marrying Krishna, since he had allied with the Pandavas, Kunti's sons and rivals of the Kauravas. The Bhagavata Purana records a short description of Mitravinda's marriage to Krishna. She chooses Krishna as her husband in a Swayamvara ceremony, in which a bride chooses a groom from assembled suitors. However, her brothers do not like it and forbid the marriage. They join forces with the Kauravas and fight Krishna. Krishna defeats the princes and takes Mitravinda away forcibly, as the other suitors keep looking. Vallabhacharya's commentary on the Bhagavata Purana adds that Mitravinda and Krishna were deeply in love with each other, but her brothers and father were opposed to this and wanted Duryodhana for her husband. A svayamvara was arranged by her father for her to choose a husband. All the princes including Duryodhana were present for this competition. When Krishna came to know of this, he also came to the venue of the svayamvara and Mitravinda appraised Krishna of her problem and requested him to abduct her. Complying with her wishes, Krishna abducted her from the venue of the svayamavara. He was challenged by her brothers, Duryodhana and other princes who wanted to marry Mitravinda. Krishna defeated all of them and took Mitravinda to Dwaraka where he formally married her. In another version, Krishna and his elder brother Balarama are described to be intentionally not invited for the svayamvara. Balarama was upset that they had been excluded for the marriage of their cousin Mitravinda. Balarama had also conveyed to Krishna that the svayamvara was a ruse as Vinda and Anuvinda wished to marry their sister to Duryodhana of the Kuru Empire. The marriage would forge alliance between Kuru and Avanti and also garner the support of Vidarbha and Magadha Kingdoms, which make the Kauravas very powerful. Balarama told his younger brother to abduct Mitravinda as she loved Krishna. As Krishna was not sure of the love of Mitravinda, he took his younger sister Subhadra along with him to quietly ascertain the wish of Mirtravinda. After Subhadra confirmed Mitravinda's love for Krishna, Krishna and Balarama stormed the svayamvara venue and abducted Mitravinda, defeating the princes of Avanti, Duryodhana and other suitors. Krishna and his queens once visited Hastinapur to meet Kunti, her sons, the Pandavas and Pandavas's common wife Draupadi. As directed by Kunti, Draupadi worships and honours Mitravinda and other queens with gifts. Mitravinda also narrates to Draupadi how she got married to Krishna. The Bhagavata Purana tells that Mitravinda had ten sons: Vrika, Harsha, Anila, Gridhra, Vardhana, Unnada, Mahamsa, Pavana, Vahni and Kshudhi. The Vishnu Purana says that she has many sons headed by Sangramajit. The Bhagavata Purana records the wailing of Krishna's queens and their subsequent leap in Krishna's funeral pyre immolating themselves (see sati). 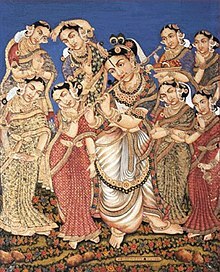 The Mausala Parva of the Hindu epic Mahabharata which describes the death of Krishna and end of his race declares that Mitravinda (Shaivya) killed herself by burning alive after being attacked by robbers while leaving Dwarka after Krishna's funeral. ^ Mani, Vettam (1975). Puranic Encyclopaedia: a Comprehensive Dictionary with Special Reference to the Epic and Puranic Literature. Motilal Banarsidass Publishers. p. 62. ISBN 978-0-8426-0822-0. ^ a b Horace Hayman Wilson (1870). The Vishńu Puráńa: a system of Hindu mythology and tradition. Trübner. pp. 79–82. Retrieved 22 February 2013. ^ a b "Five Ques married by Krishna". Krishnabook.com. Retrieved 25 January 2013. ^ a b V. R. Ramachandra Dikshitar (1995). The Purana Index. Motilal Banarsidass. pp. 705–. ISBN 978-81-208-1273-4. Retrieved 7 February 2013. ^ a b Henk W. Wagenaar; S. S. Parikh; D. F. Plukker; R. Veldhuijzen van Zanten (1993). Allied Chambers Transliterated HindiHindiEnglish Dictionary. Allied Publishers. pp. 995–. ISBN 978-81-86062-10-4. Retrieved 7 February 2013. ^ a b Vallabhācārya (2003). Śrīsubodhinī. Sri Satguru Publications. ISBN 978-81-7030-824-9. Retrieved 7 February 2013. ^ Prabhupada. "Bhagavata Purana 10.58". Bhaktivedanta Book Trust. ^ "Discussions at Dwaraka". Protagonize.com of TauntMedia.com. Retrieved 9 February 2013. ^ Prabhupada. "Bhagavata Purana 10.71.41-42". Bhaktivedanta Book Trust. Archived from the original on 11 September 2006. ^ Prabhupada. "Bhagavata Purana 10.83". Bhaktivedanta Book Trust. Archived from the original on 18 October 2012. ^ "The Genealogical Table of the Family of Krishna". Krsnabook.com. Retrieved 5 February 2013. ^ Prabhupada. "Bhagavata Purana 10.61.16". Bhaktivedanta Book Trust. Archived from the original on 21 October 2010. ^ Prabhupada. "Bhagavata Purana 11.31.20". Bhaktivedanta Book Trust. Archived from the original on 13 June 2010. ^ Kisari Mohan Ganguli. "Mahabharata". Sacred-texts.com. Retrieved 18 March 2013. This page was last edited on 23 February 2019, at 18:55 (UTC).